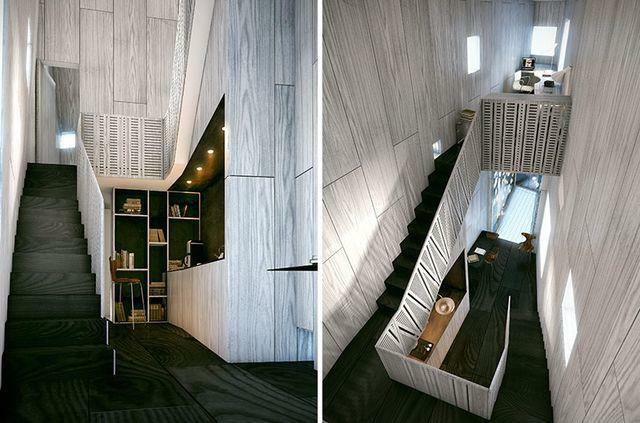 This unique modern house design surprises and amuses. Beautiful countryside landscapes provide great views and enhance spacious interior design that offers a creative office surrounded by quiet and relaxing atmosphere. American architects from Blank Studio envisioned and built this unusual modern house. This is the perfect residence for artists, writers and all creative professionals who like peaceful and secluded surroundings. The modern house design offers the interesting and unusual place to get in touch with the nature and inner self, to get inspired and create something extraordinary. The House of Writing is located in a picturesque area in ​​Switzerland. 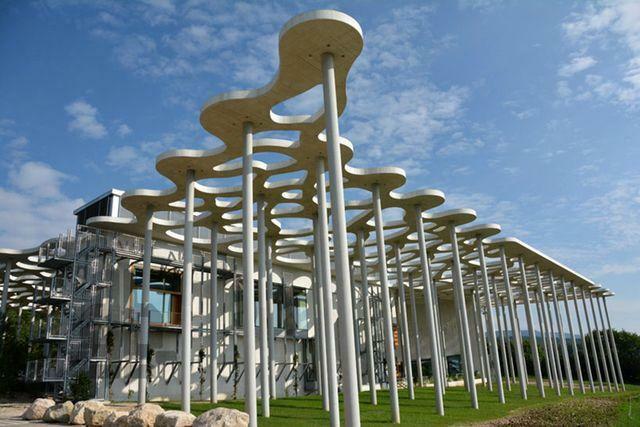 Gorgeous landscapes, combined with these unusual architectural designs and decorating ideas in futuristic style are inspiring and fascinating. Modern interior design show a strong influence of minimalist style. Tall columns and whimsical wall design offer a fantastic place to get creative. 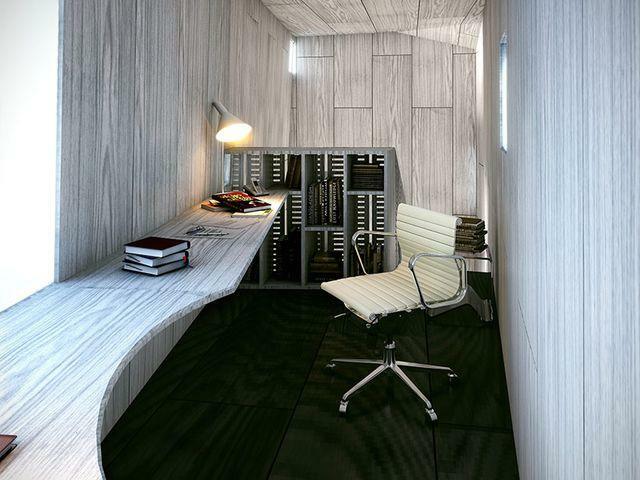 The House of Writing incorporates spatial and design elements that reflect creative thoughts and productivity. 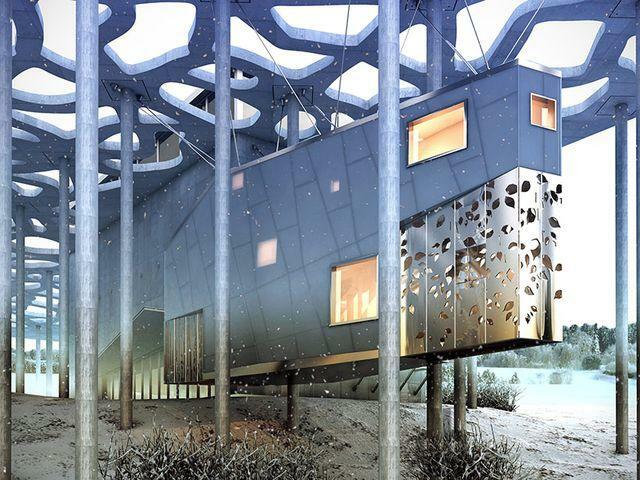 The House of Writing is a proposed wing of the Maison de l Ecriture in Montrichier, Switzerland. The concept of futuristic, unusual, creative and modern house design is proposed by Arizona-based Blank Studio Architecture, who have envisioned a two-store dwelling that will offer the resident writer contemplative spaces with minimal distraction and a quiet atmosphere. The residence has two buildings. The building, standing on the earth has all the main rooms and the main entrance. Modern kitchen, living room, dining room, bathroom and bedroom are located away from the suspended office. Modern interior design blends a lot of steel and metal, including decorative and functional perforated steel panels, which allow residents to enjoy gorgeous landscapes through the wall. The floating in the air, suspended office is hanging from the concrete roof between the columns. This amazing, functional and modern house design creates a sense of weightlessness and lightness, which are emphasized by large windows and extensive use of matte, transparent and translucent glass.